Without proper safety protections, working on a roof or on scaffolding can be dangerous. Scaffolding and roof falls can cause very serious injuries, including spinal cord injury, brain injury and paralysis. Items falling from scaffolding and roofs can also cause similar injuries to the people standing below. These accidents can even be fatal. In fact, U.S. government statistics list falls as the most frequent cause of death at construction sites. To prevent scaffold and roof accidents, Florida state and federal laws require that employers follow certain safety measures. However, this does not always happen. 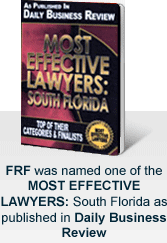 At the South Florida law firm of Friedman, Rodman & Frank, P.A., we believe that employers who fail to follow the proper safety measures should be held accountable for their employee's injuries. At Friedman, Rodman & Frank, P.A., our Miami construction accident attorneys file worker's compensation claims on behalf of injured workers. We also file personal injury lawsuits against general contractors, subcontractors or the makers of defective scaffolding, ladders and equipment. While a lawsuit cannot undo the injuries suffered in a scaffold accident, a successful result can compensate an injured worker for his or her injuries. Additionally, a successful claim can teach employers that preventing scaffold accidents is an important matter that should be taken seriously — especially when our attorneys find violations of laws, rules, codes, guidelines and regulations. If a loved one's injuries were caused by a scaffolding accident, talking to a personal injury lawyer can help you understand your options. Contact our South Florida law offices by calling us at 305-448-8585 or toll free at 877-448-8585 or by contacting us online to schedule a free and confidential consultation. Our attorneys are available 24 hours a day, 7 days a week to speak with you in English, Spanish and Creole. Sé Habla Español / Nou Parlé Creole.